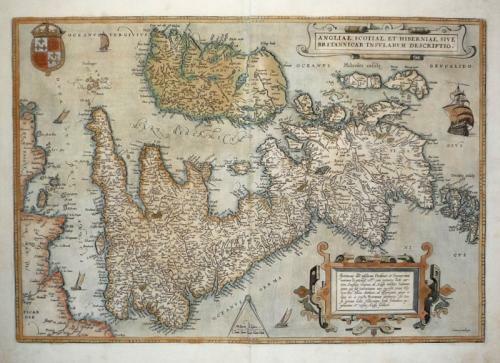 Title: 'Angliae, Scotiae et Hiberniae, sive Brittanicar: Insularum descriptio'. In good condition. A very minor tear at the right margin that crosses into the image. The paper is slightly brittle at one margin and a 1 cm piece of the image was chipped. It has been repaired by a professional and is hardly noticable. Would frame well and the faults are reflected in the price.